PILOT COVE - A Mountain Biker's Paradise? They were just finishing up the final touches before their grand opening April 9th. 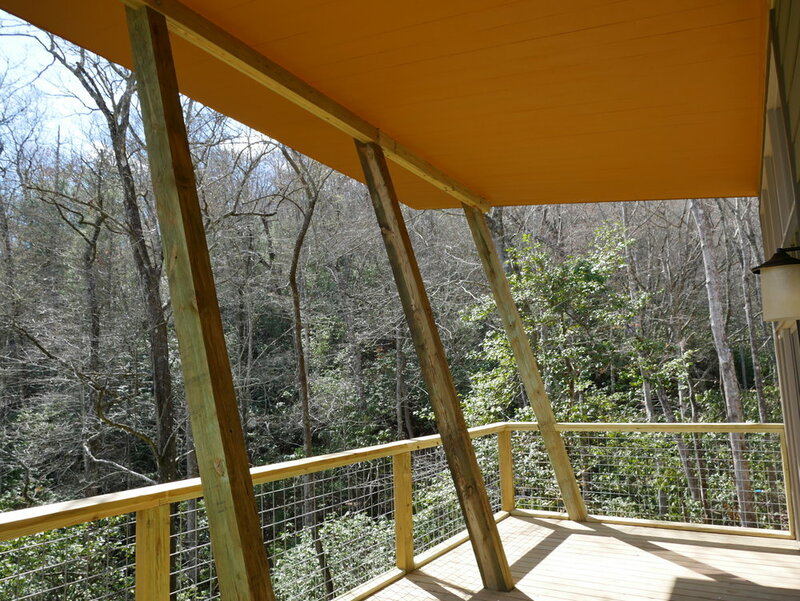 Pilot Cove is Brevard North Carolina’s newest accommodations located adjacent to the entrance of Pisgah National Forest. You can not get any closer to the trails unless you’re camping in the forest. Pilot Cove offers up a bit more luxury than what you would find at average accommodations. Their mission is to offer premier forest lodging for outdoor enthusiasts and families alike. They currently have ten cabins completed, with plans for up to 50 at full build out. A camping area is also planned and will hopefully be added by late 2017 if all goes according to plan and will include wifi, electricity, and a lockable gear shed for dry storage at each site. Pilot Cove is an amazing piece of land that is unmistakably Pisgah-- beautifully steep terrain full of rhododendron and mountain laurel. Collin O’Berry, co-owner/developer of the property, showed me around, and it is certainly an impressive spot sharing a long border with Pisgah National Forest. The property is currently 64 acres with long-term plans to open up an additional 62 acres for a total of 126 acres. They have an impressive (& steep) 500 feet of elevation change from top to bottom! If you can muster up the energy to make the pedal (or hike) up to “Sunset Point”, you are rewarded with some amazing views looking both over the Davidson River Valley and out into Pisgah. There is a large fire pit and picnic tables for guest use. Not a bad place to sit down and drink a cold one after a long day on the trails. It is certainly worth it to make your way to "Sunset Point"! The amphitheater is another impressive part of the complex. It is framed with trees that were harvested during the construction of the property. The hillside makes for an excellent natural seating area that will eventually have room for approximately 350 people! Once completed this will be used for concerts and weddings. One of the most unique features of Pilot Cove is the inclusion of private trails on the property. With around 2 miles completed and several more miles coming in the near future, there will be an impressive amount of trails for both experienced mountain bikers and families to enjoy together. The machine built trails are mostly one way with the climbing trails having a more gentle grade. All trails will be graded with the standard ski style: green, blue, black rating system. The amount of time they have spent planning everything is impressive. Nothing has been done without proper consideration. The directional trails are designed to be enjoyed by everyone! There will be options to climb up to the top or cut off midway up the mountain. Part of the trail system is a unique closed loop “flow track”. Imagine a big pump track with elevation change… and a massive wooden berm. There is some pedaling of course, but it is an impressive piece of flowy trail that would be a great way to finish up a day of pedaling around Dupont and Pisgah. I have a feeling there will be some friendly flow track competition among guests. Obviously a big part of Pilot Cove is their unique cabin designs. These are definitely not the typical “wood paneling everywhere” cabins prevalent in the area. Each cabin shares a common sleek and modern design, and there are three different sizes. They all have the same central “core” structure with a full kitchen, washer & dryer, and flat screen TV (just because you’re in the woods doesn’t mean you should have to miss the big game!). The “efficiency” cabins feature a studio style layout. The one bedroom adds a bedroom out to one side, and the two bedroom simply adds a second bedroom to the other side. It is a simple but appealing layout. The unique part of this is that the cabins were sized based upon the lot where they were built. So everything fits into the landscape rather seamlessly. Each cabin is tucked nicely into the hillside and optimized for privacy. The effort put in to laying out the facility is impressive. Each cabin has a large deck that offers unique views and a surprising amount of privacy. There are no direct views onto your neighbor’s porches or windows. It kind of feels like you’re in your own private treehouse. The cabins are nicely furnished of course, but the custom furniture that was designed specifically for Pilot Cove is really nice. Custom live edge dining tables, reclaimed wooden bed frames, and even a cool coat rack made of old knobs. There are a lot of little details that help to make Pilot Cove unique. Pilot Cove is offering a premium experience for anyone who wants to be able to enjoy the forest straight out their front door. Mountain bikers, rock climbers, hikers, and all outdoor enthusiasts will certainly enjoy Pilot Cove. I also believe it will be a great place for those that wish to spend their time in Brevard shopping and dining or hanging out at one of Brevard’s many outdoor festivals. The comfort of a modern luxury cabin, the proximity to town, and the access to the forest allow Pilot Cove to appeal to a wide range of travelers, including families. A group of mountain bikers will be equally as welcome as a crew driving the length of the Blue Ridge Parkway in their classic cars. Essentially anyone seeking out premium lodging while exploring our wonderful home of Brevard North Carolina should check out Pilot Cove. See the gallery below for additional photos. They were hard at work furnishing the cabins as I was taking pictures! 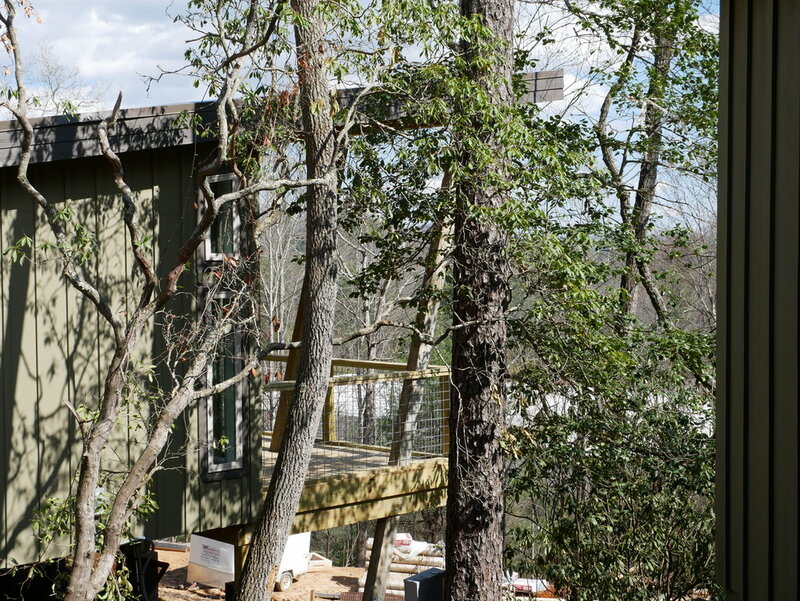 You can really see why it feels like you're in a tree house! The entry to each cabin has a sort of "mud room" where you can hang up your riding gear and do laundry. Each cabin has a washer and dryer. The bike friendly road leading in to Pilot Cove passing by Cabin 1. Interior of the studio style efficiency cabins. We offer fully customizable guided mountain bike tours in Pisgah National Forest & Dupont State Forest. All rides are designed for what you want! We are Wilderness First Aid certified and fully permitted to operate in both Pisgah & Dupont. Let us help you to make the most out of your time in Brevard, NC by taking the stress out of planning your rides! We will show you the best trails for your ability and style of riding. Hit the trails, jump in the river, and finish up at any number of amazing local restaurants (or Breweries!). Feel free to send us an email or give us a call if you have any questions! In Brevard, It's not just about riding Pisgah! You can't miss Dupont!